Natural medicines are widely utilized in human healthcare. Their beneficial effects have been attributed to the existence of natural active ingredients (NAI) with a positive impact on disease treatment and prevention. Public awareness about the side effects of synthetic chemical compounds increased the need for NAI as well. Clinical applications of NAI are limited by their instability and poor water solubility, while micronization is a major strategy to overcome these drawbacks. Supercritical carbon dioxide (sc-CO2) based nano techniques have drawn great attention in nanomedicinal area for many years, due to their unique characters such as fast mass transfer, near zero surface tension, effective solvents elimination, non-toxic, non-flammable, low cost and environmentally benign. In terms of functions of sc-CO2, many modified sc-CO2 based techniques are developed to produce NAI nanoparticles with high solubility, biological availability and stability. 5 types of promising methods, including gas-assisted melting atomization, CO2-assisted nebulization with a bubble dryer, supercritical fluidassisted atomization with a hydrodynamic cavitation mixer, supercritical CO2-based coating method and solution-enhanced dispersion by sc-CO2 process, are summarized in this article followed by a highlight of their fundamental synthesis principles and important medicinal applications. Keywords: Supercritical, micronization, natural active ingredients, nanoparticle, nanomedicine, drug delivery. Keywords:Supercritical, micronization, natural active ingredients, nanoparticle, nanomedicine, drug delivery. Abstract:Natural medicines are widely utilized in human healthcare. Their beneficial effects have been attributed to the existence of natural active ingredients (NAI) with a positive impact on disease treatment and prevention. Public awareness about the side effects of synthetic chemical compounds increased the need for NAI as well. Clinical applications of NAI are limited by their instability and poor water solubility, while micronization is a major strategy to overcome these drawbacks. Supercritical carbon dioxide (sc-CO2) based nano techniques have drawn great attention in nanomedicinal area for many years, due to their unique characters such as fast mass transfer, near zero surface tension, effective solvents elimination, non-toxic, non-flammable, low cost and environmentally benign. In terms of functions of sc-CO2, many modified sc-CO2 based techniques are developed to produce NAI nanoparticles with high solubility, biological availability and stability. 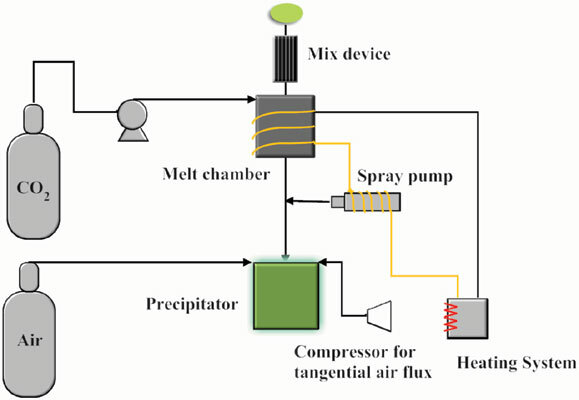 5 types of promising methods, including gas-assisted melting atomization, CO2-assisted nebulization with a bubble dryer, supercritical fluidassisted atomization with a hydrodynamic cavitation mixer, supercritical CO2-based coating method and solution-enhanced dispersion by sc-CO2 process, are summarized in this article followed by a highlight of their fundamental synthesis principles and important medicinal applications.